For the complete gallery of Nissan headliners at the 2019 CIAS, please click here. 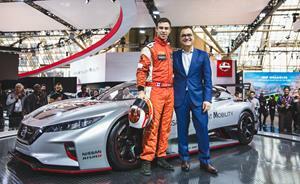 /EIN News/ -- TORONTO, Feb. 15, 2019 (GLOBE NEWSWIRE) -- Today at the 2019 Canadian International Auto Show (CIAS) in Toronto, Nissan marked the first public auto show display for the all-new LEAF NISMO RC, an electric race car developed by NISMO featuring an aggressive body shape, advanced battery technology and all-wheel drive capability. During its media presentation today, Nissan officially announced the LEAF NISMO RC will be in action on Canadian race tracks as one of the official pace cars for the 2019 Nissan Micra Cup, entering its fifth season this year. 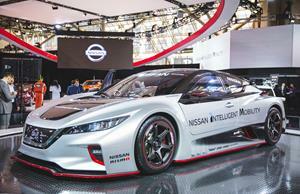 The purpose-built, zero-emission race car from NISMO is sure to turn heads at the CIAS. A long hood and Nissan's signature V-motion grille highlight the totally restyled front end. The distinctive silver-and-black paint scheme with NISMO red accents – similar to the Nissan Formula E car – make the LEAF NISMO RC seem like it's in constant motion, even when sitting still at the starting line. Using its racing know-how, NISMO created an exciting way to show the potential of Nissan's zero-emission technology – a key component of the Nissan Intelligent Mobility vision. Powering the all-new Nissan LEAF NISMO RC are two electric motors at opposite ends of the chassis. The motors produce 322 combined horsepower (161 horsepower each) and an astounding 472-lb. ft. of instant torque to the wheels. They more than double the maximum power and the torque output of the previous LEAF NISMO RC, which was introduced in 2011. Drivetrain technology sourced from the new Nissan LEAF include the high-capacity lithium-ion battery and inverters. A new all-wheel-drive system gives the LEAF NISMO RC its outstanding cornering prowess. Continuing a Nissan tradition, another Nissan wearing heavy-duty DOMINATOR Tracks from American Track Truck is on display at an auto show. 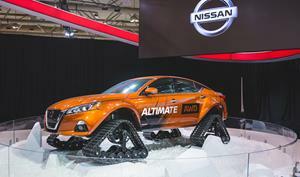 Unlike the “Warrior” family of Nissan crossovers equipped with tracks, this one-off vehicle is a sedan, symbolizing the AWD configuration for the 2019 Altima in Canada. The tracks measure 1,220 millimetres/48 inches long, 750 millimetres/30 inches tall and 380 millimetres/15 inches wide. The Altima-te AWD required more extreme body and chassis modifications compared to the changes that were made on the Rogue Warrior project vehicle. The most prominent exterior modification to Altima’s exterior is seen in the front and rear fenders that were flared out by 180 millimetres/7 inches on each side, to accommodate the DOMINATOR, track system, expanding the total body width by 360 millimetres/14 inches. This results in a noticeably assertive stance, while maintaining Altima’s sedan design essence and flowing lines. The Altima-te AWD will be on display at the 2019 CIAS for public days, and will then be displayed at the Vancouver International Auto Show in March. To see the video story and read more about the Altima-te AWD, click here. Nissan Canada Inc. (NCI) is the Canadian sales, marketing and distribution subsidiary of Nissan Motor Limited and Nissan North America, Inc. NCI was the first Japanese-based automaker to incorporate in Canada in 1965, and now directly employs 306 full-time staff across offices in Vancouver (BC), Mississauga (ON), and Kirkland (QC). There are 208 independent Nissan dealerships, including 81 that also act as Nissan Commercial Vehicles dealers, 114 electric vehicle-certified dealers, and 42 INFINITI retailers across Canada. Nissan is a global full-line vehicle manufacturer that sells more than 60 models under the Nissan, INFINITI and Datsun brands. In fiscal year 2017, the company sold 5.77 million vehicles globally, generating revenue of 11.9 trillion yen. On April 1, 2017, the company embarked on Nissan M.O.V.E. to 2022, a six-year plan targeting a 30% increase in annualized revenues to 16.5 trillion yen by the end of fiscal 2022, along with cumulative free cash flow of 2.5 trillion yen. As part of Nissan M.O.V.E. to 2022, the company plans to extend its leadership in electric vehicles, symbolized by the world's best-selling all-electric vehicle in history, the Nissan LEAF. Nissan’s global headquarters in Yokohama, Japan, manages operations in six regions: Asia & Oceania; Africa, the Middle East & India; China; Europe; Latin America; and North America. Nissan has partnered with French manufacturer Renault since 1999 and acquired a 34% stake in Mitsubishi Motors in 2016. Renault-Nissan-Mitsubishi is today the world’s largest automotive partnership, with combined sales of more than 10.6 million vehicles in calendar year 2017.